The 2013 show season is now over, but with a super show to end it. But there are still a few things left for the year including a "Drive It" day, the Christmas Dinner and of course the regular monthly Noggin 'n Natters. Keep a eye on Events for 2014 dates as we are planning already. Wow - what an amazing end to a very good year of shows - 220+ cars, warm weather, a lot of new members joining and a host of new cars we had not seen before. It was even commented that we have never seen the visitor's car park as full either. Now just for a few seconds let's remember last years 'end' of season show - rain, wind, a small but keen band of 40 cars and closing the show at midday because of the awful weather - in comparison this year we had people still arriving after the awards to look around and there wasn't a rush to leave. The committee were kept busy all day fitting the arrivals into the correct decades, but in the end had to go with the flow as the numbers beat the spaces in the correct decades - many thanks for the patience and understanding by the owners, but everyone seemed relaxed and enjoying the entertainment of yellow jacketed madmen waving their hands around. At the gate they ran out of entry forms and the membership secretary ran out of membership forms - all signs of one of the best days we have had for many years. I don't know where to start in describing the wide range of cars we had on show - small 50's & 60's family cars, American Muscle cars, traditional British sports cars, traditional large British saloons, Land Rovers, campervans, a fair few BMW Series 3's, a selection of specials and more than a few BL Metro's - have a look at the photo's to see most of them. The new 'Visitors' award caused fun, especially amongst our younger visitors - boys gravitated towards the big American cars and Hotrods while the girls liked the 'yellow' campervan - and for his enthusiasm in showing them how the camper converted and letting them climb inside Peter Piggot was awarded a Rosette for his 1986 VW T25 Devon Camper. The winner of the visitor's award was Malcolm Hartley with his 1955 Riley RME, runner up being Vince Murphy's 1962 Ford Consul Capri. The judges for the club 'pride of ownership' awards had a tough time - it was a long walk around a lot of very nice cars, but in the end proved they are on the same planet as the visitors as they awarded Malcolm the 50's Class Award and Vince the 60's Class Award without knowing the result of the Visitors Choice. 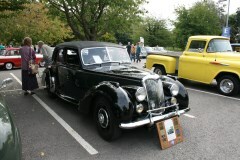 The oldest winner was a 1934 Rover 12 Sportsman Saloon (50's Class) and the youngest a 2006 Pilgrim Sumo Cobra Mk3 Replica (Kit and Specials Class) - 72 years apart. Clubs were represented by the West Sussex Morris Minors and The Manhood Classic Cars (and nobody was brave enough to ask what the criterion was to join!) - but they did win the Club award. We had a lot of nice comments about the show and received emails of thanks after the show. Everyone seemed to enjoy chatting about their cars and generally relaxing in their favorite hobby before many of them will be tucked up for winter (the cars not the owners!). Many thanks to the auto jumblers who seemed to be busy, the raffle ticket sellers, the ladies in the 'tuck wagon' who I don't think sat down all day as a steady stream of orders came in, the visitors and last but definitely not least to all the owners whose cars really made the day. Click here for 200+ photos. Same location, different place!. The Worthing Rugby Club is one of our popular venues especially when the sun shines - as it was scheduled to do - as well as the cars, people seem to relax here more and sit in the sun, have picnics, chat about cars, walk the dogs and as it's a rugby club can also have a cold beer. This year we had a sight change of where we would be positioned. The rugby club had re-seeded the two pitches we normally use and hence preferred if we didn't park cars on them now - a slight worry as they were talking of us using the car park. But they came up trumps and allowed us to use the training pitch which is beside the club house area. This actually seemed better and more friendly than the two big pitches we used to have with still plenty of space surrounded by trees and the club house nearby. So we arrived in the dry, a bit blowy and set up. 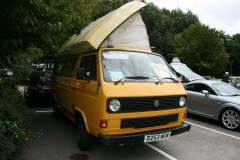 A few cars arrived very early (a good sign) and our keen auto-jumblers were there setting up with the rest of us. The Ford TEC (The Enthusiasts Club) arrived with a line of modern classic fords showing real enthusiasm - especially as they hadn't heard of the show until the Wednesday before. They were worried that their cars were too modern, but soon felt welcome as people went and spoke to them - and they won the club trophy. 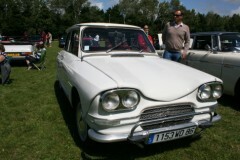 By 10am a steady stream of cars were arriving, some old faces and some new with a wide range of cars from our regular pre-50's Post Office van to a lovely drophead Daimler to a left hand drive Simca and many more in-between. Also, a VW Vento , a Fiat Multipla and even TWO Panther Kallista's (one was mine and we have never had two at a show) - a good an varied show - with well over 100 cars over the whole day. As the 'Public Vote' was popular in the last shows were we introduced it, this was another prize for this show and likely to become a regular as it gets everyone involved. For all the results see the next Newsletter. 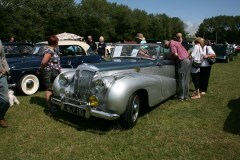 Many thanks to all who came and made it a really good day - hope to see you at the Chichester Show next month. Ten for Nine!! I thought I was having a reoccurring nightmare of an old England Cricket Test Match score; but no, it was more serious than that!! With a beautiful morning already upon us and the temperature increasing by the hour it was going to be a glorious day for the charity event. As with all best laid plans they never run 100% and so it was when we arrived the "cleared" rear car park to hold the show was not that clear after all. How- ever I'm a great believer that things happen for a reason and so "we" took the grass option and must say it was the better of the two alternatives. In future, weather permitting, the grass area has to be first choice. Guild Care, one of the two current SCS supported charities, joined us for the day - great to see a physical presence and the opportunity for the charity to introduce themselves from their marquee, plus mingle with club members. So, all set up and ready to go by 8.45 am and only one thing needed............. .......some cars !!!! 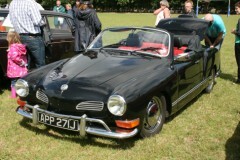 At 9 am there were only ten cars and two auto-jumblers on site; two of those cars belonged to committee members. In fact even Sharon's food wagon was holding fire before cooking those lovely bacon rolls!! It was suspected that the show could suffer as it was clashing with the Festival of Speed (FoS) and the vintage / classic car event at Ardingly. As you know the FoS date was changed at short notice as a result of the German GP date; so that was bound to impact upon our day. 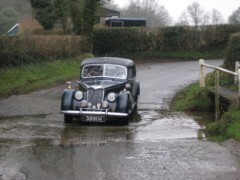 But somebody must like us, as by 10am the cars started to roll in (phew !!) and as the morning progressed the numbers progressed towards the 100 mark and levelled out at that and there were certainly some glorious vehicles attending. The sun was beating down and how thankful for areas of shade on this day - not a lot of pedestrian movement but rather just taking it easy and chatting away the hours - how very civilised and traditional!! 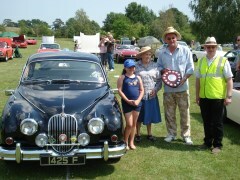 With the charity show, the Bennett Trophy is a much sought after jewel and it was with great pleasure that the award went to Grant Ford displaying a magnificent black Jaguar Mk2 - just stunning. It was agreed that due to the heat and attendees bailing out early there would be two show prizes (1st & 2nd) along with the Bennett Trophy. 1st prize went to David Walsh with a perfect example of a 1955 Hillman Californian Mk8 and closely followed by Chris Gould with his Austin Epsom (home built Austin 7 / Morris Minor mix); again another beautiful presented classic. Congratulations to those deserving winners. The committee would like to thank everyone who attended the day in such extreme temperatures and also for choosing the SCS Charity Show, when there was so much else to choose from on the day. Your support was very much appreciated, as we know it is by the clubs two charities. Thank you. Seventeen members enjoyed a very pleasant event of pizzas and bowls at The Bull Inn in Henfield on Friday 5th July. You wouldn't think that it would be that difficult to knock down nine wooden bowling pins with three large rubber ball's....but it is! Great fun with much barracking and good humour all round. The Bull did us proud with the quantity and quality of the refreshments and very efficient service. As for the victors; John, Sandy, Eric and Janet took team honours, while Alan Bailey walked away with a bottle of the Chairman's finest wine for winning the knock out completion. Many thanks to all that turned up and those that made the event happen. Over forty members enjoyed a very enjoyable B-B-Q and quiz event at The Fox, Patching on the 26th July. 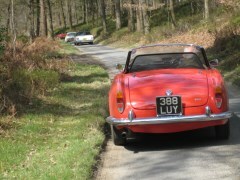 The perfect sunny Sussex weather also ensured that we had a good turnout of members' cars. 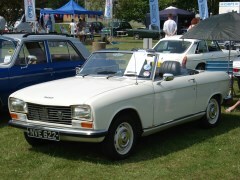 Makes included; Austin Healey, Riley, Volvo, Wolseley, Sunbeam, Talbot, Range Rover, and Borgward. 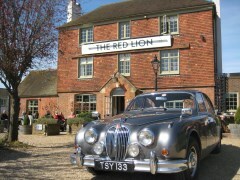 All the cars attracted a lot of complimentary comments from members and the many other visitors to the pub. However, I think that it is fair to say that David and Marilyn Burt's stunning and very rare right hand drive 1959 Pale Blue Borgward Isabella Coupe was the star of the show. The Fox laid on their usual wonderful B-B-Q and looked after us very well, with an exclusive bar for members and if needed , use of the events marque. Following the meal, it was time for one of John Leaney's famous, or should that be infamous, quizzes. Teams ranged in size from twelve to five, with poetic justice triumphing with the team of five winning!. Just goes to show, that quality will always win over quantity. Many congratulations to; Joy, Ron & Steve Smith and Dave & Marilyn Burt for their victory. If you would like to see how well you can do, John's quiz is included in the "A Bit of Fun" section of the magazine. The team of five got a very impressive 24 out of 30. With the evening too soon over, it was time to head home. Many thanks to all that turned up and to Richard Long, John Leaney and the team at The Fox for making it all happen. Photo's will be here soon. A bit like London buses, you wait ages for one to come along and then two arrive in quick succession, the Society's second consecutive new show took place on Sunday 17th June at the National Trust Sheffield Gardens site. Like Newhaven before it, Richard Long had been inspirational searching out another superb venue for one of our shows. 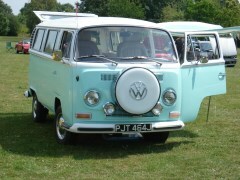 Sheffield Park is famous for its outstanding gardens, lovely tea room, close location to the Bluebell Railway and stunning views of Sussex, and with a very large enclosed grassed area, a perfect location to hold a classic vehicle show. Being a new venue for us, there is always a little trepidation as to how things will work out. Is the showground large enough, can we get display vehicles in and out safely, is there a good spot for the auto jumbles, where shall we set up the club gazebo? Needless to say, with Richard's planning and many reccies to the site, and with the help and support of the National Trust staff, the showground, with the exception of some sheep deposits, proved to be the perfect venue for one of the SCS car shows. On the day we had just over a hundred vehicles with a round forty five being non-members, plus eight autojumblers and many hundreds of spectators. The Society and the National Trust had heavily advertised the car show and judging by the number of visitors coming and going all day this seemed to have done the trick. Another first was the way display vehicles were judged. Normally Committee members and volunteers wander around a show clipboard in hand trying to come up with class winners, something I personally find very difficult to do. This time all the winners and runners up were selected by fellow exhibitors and the visiting public. This takes the pressure off the "volunteer judges" and allows everyone who comes to the show the opportunity to be part of the event rather than just a spectator looking at the display vehicles. 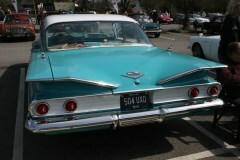 Children particularly seemed to like choosing their favourite vehicle. Many congratulations to those that took away a trophy and I hope that all those that attended enjoyed the show and will be back next year. Comments received on the day certainly gave it the thumbs up and the National Trust site topped Bewl Water in all respects with regards to the helpful staff, location of facilities and refreshments and of course the gardens themselves. 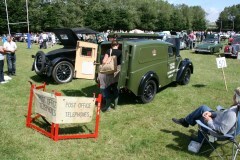 The Trust's kind offer of complementary access to these for members and visitors displaying a vehicle was a real bonus and certainly proved popular with non-car types. This was a new idea for this year - a more relaxed social show in an interesting place. For this new venture the interesting place was the old fort at Newhaven. Constructed into the cliffs at the mouth of Newhaven harbour in the 1860's it has been a military fortress for two world wars and has now been restored as a museum. 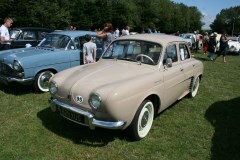 The show was was held inside of the Fort with the cars 'on parade' on the inner parade ground. As with any parade ground 'falling in' had to be kept to a timetable with all cars having to be 'on parade' by 10am to comply with the Forts Health and Safety rules, and they had to stay there until 4pm. Many thanks for the understanding as this was out of our control. 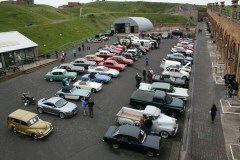 And thanks to those who parked up in the moat outside and still enjoyed the day. Over 50 cars arrived and lined up inside with examples from 1950's to 1990's, little Mini's to huge American's and sports cars to commercials. All in all a nice spread of what makes our hobby interesting. The purpose of the 'relaxed' social approach was to allow everyone to take in the extensive displays of military history and to let people wander around the fortifications as well as of course looking at the cars. The other idea was to give the committee more time to talk to people and look at the cars themselves as normally they are too busy 'organising'. To this end a change in judging took place - it wasn't done by the committee, but by the visitors themselves - both those who came to the show for the cars and those who came to visit the fort itself. 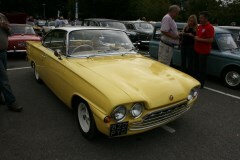 The result was 1 Brit and 2 Yanks, with the E-type being beaten by a Chevrolet Pickup, which itself was beaten by the biggest car at the show - a Mercury. Of course no show would be the same without our Autojumblers and this time they were spoilt by having a huge nissan hut to go in, but except for a slight bit, there was no rain - the weather was kind to us again. So for our first 'social show' a lot of people gave positive comments, including those who had visited the fort and didn't know a car show was on, had never been to one before and found it very interesting. Many thanks to all who made it a success and hope you will join us next year. Where the March Drive-It, enjoyable as it was, was carried out in grey and damp conditions, the April event was driven in the most perfect blue sky and sunny weather. Richard had once again pulled out all the stops and put together a cracking drive, not only through the delightful Sussex countryside but also through the equally stunning Surrey scenery. Eighteen cars and around forty members and friends assembled at the Red Lion Pub in Ashington for a pre drive coffee and catch up before setting off on the first 16 mile leg of the Drive-It to one of our regular meeting points at The Owl, Kingsfold. This first stint would set the scene for the whole day, with off the beaten track narrow lanes, horses, cyclists and walkers to contend with! Following more tea, coffee and good company at The Owl, the SCS ensemble set off in a number of small convoys for the second 27 mile section of Richard's route to the Denbies Vineyard. I know that I have said this before, but it never ceases to amaze me what a great selection of cars we have in our club. Considering there were just eight cars in our little group, the age and ranges was pretty diverse with a little 1952 Triumph Mayflower in the lead and a 2001 Aston Martin DB7 as Tail End Charlie, while the other six cars included; '82 Triumph TR8, '63 & '99 Alfa Romeo Spiders, '78 Oldsmobile, '88 Reliant S1 and a very delightful '72 Peugeot 304 Cabriolet. 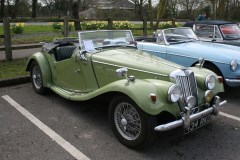 The rest of the club was represented by; MG, Austin Healey, Jaguar, Mini, Bentley and of course a Riley or three! Fantastic. After 90 minutes or so of driving through some of Surrey's best kept secret roads, villages and scenery we all arrived safely at Denbies for a regroup and the opportunity to compare notes on what we all agreed was an interesting and at times moderately challenging drive. Those who had not done a Drive-It before were particularly taken with the whole experience. Denbies proved to be a great place to end the drive, or indeed start a drive as another club had done, due to its location, lovely conservatory style cafe, shops and home produced English wines and beers. The day ended with everyone thanking Richard for all of his hard work and for putting together such a great drive and laying on such good weather. Richard can now put his feet up for a month or two as the next Drive-It is not until October! He did say to me that he has already given it some thought and that it will be "....from somewhere to somewhere, with the latter somewhere being where the AGM is being held!" Richard and Garry Goodey are looking at a number of options for the 2013 AGM and details will be published once a venue has been selected. The day started out as a slow trickle and then turned into a torrent. And for once it had nothing to do with the rain, but the flow of cars and commercial vehicles pouring into the Chichester College car park showground! Setting up at 8.00 and with the ground still a little damp and the sky a very grey, the Committee hoped that if we got a hundred plus vehicles on show then we would have done pretty well. 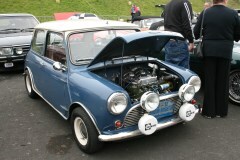 It is fair to say that our conservative estimate was way off and by the end of the show over two hundred vehicles and probably a similar number of casual visitors had made this show one of the best attended April events in recent times. We were parking cars in parts of the car park that we had never needed to use before! The range, ages and values of the vehicles on show was once again widespread and diverse and provided a visual potpourri of splendour and colour for all those at the show to see.A very large assortment of USA made machinery proved to be very popular with young and old alike. 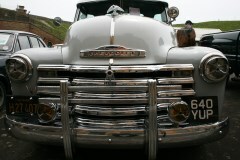 The mix of vehicles that won prizes once again highlights why our shows are so well received by members and visitors alike who are guaranteed to see something unique and a different. 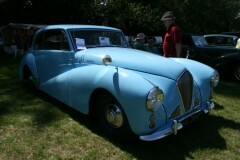 Vehicles that won prizes included: '55 Talbot AX65, '46 Morris Z Van, '57 Ford Anglia 100E, '54 Wolseley 4/44 Police car, '63 Austin Healey 3000Mk2, '64 Triumph Herald 1200, '74 MGMGT,'76 Austin Allegro Vanden Plas, '88 Lotus Esprit, '85 BMW 318, '85 Ford Crown Victoria Highway Patrol Police Car, '02 Audi TT and best at show '66 Jaguar MkII and a '61 Bedford JO Pickup. Due to the protracted winter and endless inclement weather, this was the first time in six months that many of the vehicles on display had seen daylight! 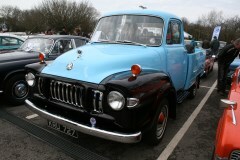 In addition to the cars and vans on show, there were around a dozen autojumblers that had a fairly productive time and the Committee would like to thank them for their contribution to this very successful show. In addition, Peter Haynes reported that he was busy much of the day with membership renewals and a good number of first time visitors joining the club. This first show put a smile on John Leaney's face as it generated a solid income for the Society and more than covered the cost of hiring the venue and show signage. A very big thank you to all those that contributed to our first show of 2013, and from comments and conversations that I had on the day, members and visitors alike are looking forward to the next five being just as good. Click here for lots more photos. 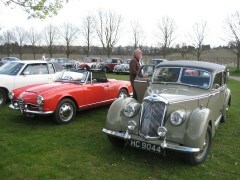 It was brave decision to even think of planning an event in March given the weather recently, but nobody can say that SCS members are fair weather only drivers - 11 classic cars and a few moderns took part in early season "drive it day" to start the season off. We started with coffee at The Gardeners Arms in Sompting - an interesting pub with a railway carriage which looks like it crashed through the pub wall (not really - it was planned to be built into the pub before it arrived). The drive took us over Sompting hill, down to Bramber and then along some interesting country roads travelling East. The route kept to quiet roads and avoided the main roads most of the time in one case the road was so quiet we got a fly past by a barn owl. To add to the fun some of these roads were narrow, and we even had to cross a ford or two. 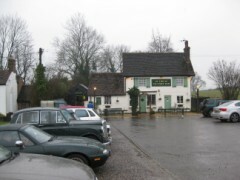 Our lunchtime stopover was at The Victory Inn on the green at Staplehurst. If you look carefully you can see the snow falling as we arrived. The pub was forewarned and we had already booked our meals and snacks in advance and with much precision the pub staff quickly had our food coming out to be served. After a rest and of course some good social chatting we set off again, along more quiet and narrow roads with a bit of rain and a little bit of snow to keep us alert. Obviously, some people found it amusing to see a line of classic cars appearing one after the other - its actually surprising how nice modern motorists are in giving way to a line of classics when they come across them on a narrow lane. Our final destination was a visit to CCK Historic (click the link to see their website) - a classic restoration company who specialise in classic racing, having had many of their, and their customers cars race at the Goodwood Revival. 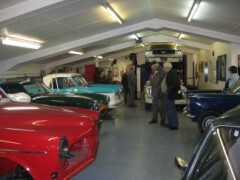 We were welcomed with coffee and biscuits and were allowed to roam around their workshops and look at all the cars they are working on and also their museum which has a very interesting collection of cars including a stretched mini built for Lord March which seats 6 in comfort. Shaun, who started CCK 27 years ago was there with his team to chat to us and explain all the aspects of the work they do. Everyone had a good time pottering around (and I am sure getting ideas). CCK also do all sorts of classic restoration and servicing, not just for racing and the quality of their work and their enthusiasm was overwelming. Many thanks to Shaun and his team at CCK for such an interesting time, also thanks to the staff at The Gardeners Arms and the Victory Inn for 'feeding and watering' us. I think everyone will agree this was a really good start to a full year - and the next Drive It Day is already planned for the National Drive It Day on 21st April.